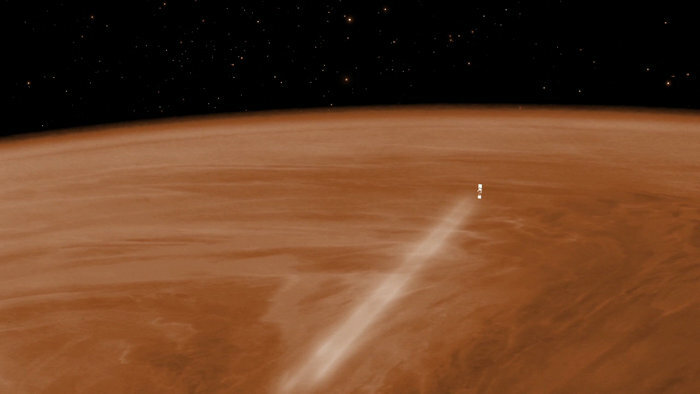 Having made over 3,000 orbits of Venus over the past eight years, ESA’s Venus Express has (as of May 15) completed its science mission and is now in the final few months of its operational life. With a nothing-left-to-lose attitude, the spacecraft recently made a daring and risky dive down into the upper layers of the planet’s thick atmosphere, coming within 80 miles of Venus’ broiling surface on July 12 — that’s the closest any human-made spacecraft have gotten to Venus since the Soviet Vega balloon-and-lander missions of 1985! As dangerous as it may have been for the spacecraft, Venus Express survived the encounter and grabbed some valuable data about the planet’s atmosphere along the way. It’s now working its way up to a higher altitude orbit, but there’s no escaping the fact that its fuel reserves are nearly depleted and it will soon be back on its way down into Venus’ atmosphere on a mission-ending, one-way trip. Read the rest of my article on Discovery News here. Previous Post Europa Is Covered In Bacon. That Is Why We Must Go.